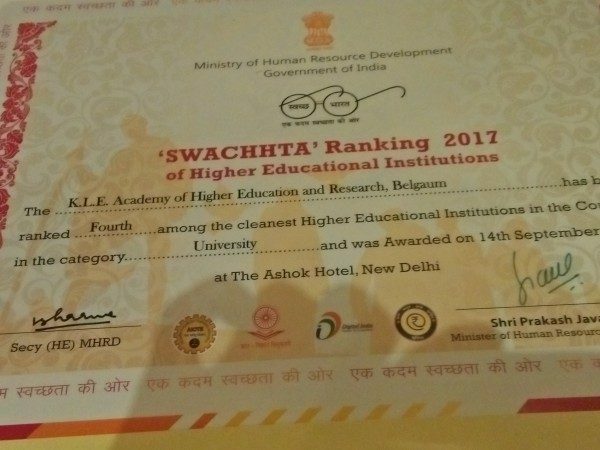 An award ceremony based on ‘SWACHHTA’ Ranking 2017 of Higher Educational Institutions was held in New Delhi recently. Union Human Resource Development Minister, Shri Prakash Javadekar gave away the prizes to the awardees. Shri Prakash Javadekar congratulated the awardees of ‘SWACHHTA’ Ranking- 2017 of Higher Educational Institutions. Speaking on the occasion, the Minister said that the Swachh Bharat Abhiyan is the most significant cleanliness campaign by the Government of India. Under this mission more than four crore and eighty lakhs toilets were constructed in India since 2nd October, 2014 and more than two lakhs villages are now open defecation free. O.P. Jindal Global University, Sonipat, Haryana. Manipal University Jaipur, Jaipur Rajasthan. Chitkara University, Kalu Jhanda (Barotiwala), Solan, HP. K.L.E. Academy of Higher Education and Research, Belagavi, Karnataka. Dayalbagh Educational Institute, Agra, UP. An exercise to rank Higher Educational Institutions (HEIs) on the basis of cleanliness and hygiene has been undertaken and concluded. Parameters for a clean campus were formulated, like student/toilet ratio, kitchen hygiene, availability of running water, modernity of toilet & kitchen equipment, campus green cover, garbage disposal in hostels and academic buildings, disposal techniques, water supply systems and also a certain weightage to whether the institutions has adopted any neighbouring locality or village to spread awareness & activities in Swachhta. About 3500 HEIs responded to the online invitation, submitting all their details as per format. The top 174 institutions were shortlisted as per criteria and officials from UGC and AICTE inspected the premises of all 174 institutions. Finally, the top 25 institutions across various categories like Universities, Technical Institutions, Colleges and Government institutions were selected and they were awarded on the occasion. This exercise will help generate peer pressure amongst institutions in the all important area of cleanliness. some improvements instead of just focusing on his Institutes.